I saw this photo online and hoped I'd remember to try it out for as a potentially roller derby bout-day look. So I tried it out while working at home. DGD's first home-team bouts are in less than a week! I kept the eyes simple with a black cateye, purple on the waterline, light shadow, glitter, and mascara (not pictured in first photo). 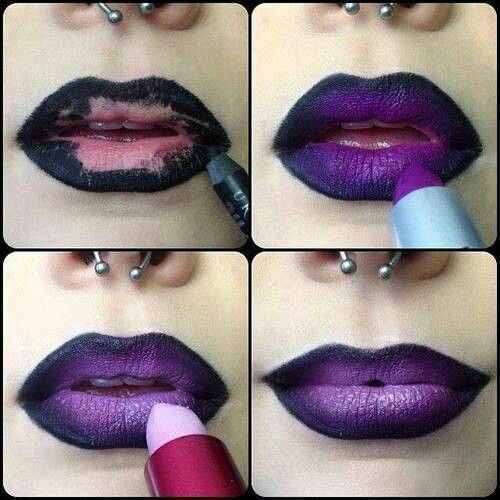 The lips are waterproof black eyeliner, MAC Magenta lip liner, and MAC Heroine lipstick. I used some fine glitter to set it. It seems to hold up great! After 4+ hours, I did one touch-up. Now come watch me hit people on skates in this look!